"The '60s was such a golden period. The songwriting was fresh and pure." 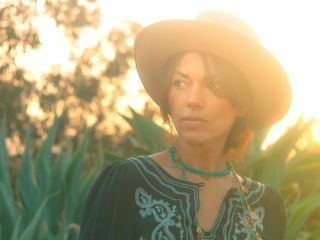 The Rickenbacker guitar jangle, the girl group harmonies, the power-pop backbeat - as a member of The Bangles and in her solo work, Susanna Hoffs has had more than a passing flirtation with the sounds of the 1960s. But on her brand-new, Mitchell Froom-produced solo outing, Someday, it's a full-blown love affair, as Hoffs virtually time travels to the lush, ultra-sophisticated period of Burt Bacharach/Hal David radio pop. It's unapologetically retro without a trace of kitsch or irony, and when Hoffs wraps her still-girlish voice around phrases that mirror the moves of Petula Clarke or Dusty Springfield, she distills complex sentiments into moments of engrossing emotional clarity. "I wanted to sing the kinds of songs that really meant the world to me when I was growing up," Hoffs says. "There was a certain kind of purity in that era. It was all heart." Aiding Hoffs in the writing and recording of Someday is a relative newbie, 27-year-old Andrew Brassell, barely old enough to remember The Bangles' glory years let alone the '60s. Hoffs has nothing but raves for Brassell ("He's a big, huge talent"), who wound up co-writing eight of the album's 10 songs. Hoffs sat down with MusicRadar recently to talk about the importance of clicking with collaborators, her awesome Spotify songlist, how the record business of 2012 isn't as bad as everybody says it is and why her voice sounds the same as it did nearly 30s years ago. So many writers have a fear of the blank page - or nowadays it would be a blank computer screen. What about you? When you sit down with a guitar and a notepad, is it scary? Do you feel like sometimes you just have nothing to say? "It can be scary, sure. I think all writers and artists go through that. You know, I was talking to somebody the other day who told me that it had been 15 years since my last solo record, and it really surprised me. But you know, during that time span, I did two Bangles records, and I wrote a lot of songs. I just could never get to the solo record for some reason. A lot of songs I wrote that could have been on a solo record wound up on Bangles records. "I think that I just didn't have a good period of time to focus. But it's OK, because it allowed me to have these lucky series of meetings with people who ended up putting together the missing pieces to the puzzle, like Andrew Brassell, who is now a great friend. I met him through my niece - she had moved from Nashville to LA, and she knew him from the local scene in Nashville. "Very quickly, I sensed that Brassell and I could write together, which was a complete surprise because I'm a lot older and a lot busier. But here was a kid with a guitar glued to his hands with a singular focus in life. All he wanted to do was write songs, and he was this writing machine. He'd show up at my house strumming the guitar, and I'd hear these melodies running through my head. I just wanted to sing along to everything he was playing, so finally that's just what I did. "The great thing is, it was easy. It didn't feel like I was staring at that blank page or blank computer screen. I wasn't sitting there with a guitar going, 'OK…' And I have done that. Or what happens a lot of the time is, I'll start songs and never finish them. Finding somebody to partner up with really helped me reel everything in." How did you hook up with Mitchell Froom? "Mitchell I've known for some time. He played the keyboard part on Manic Monday, and he did some other keyboard parts on the Different Light album. I ran into him with Andrew at Largo, this really great place to hear music, and he was immediately interested in hearing the music and getting involved. He could tell from the excitement in my voice that I was genuinely enthused. So he called me, and then Andrew and I went over with our guitars and just sang the songs. That's what started it." Now, you've worked with some pretty big producers in the past. And, of course, Mitchell is a pretty big producer. What made you think that he was the right guy? "He really liked the material, and even though he was hearing it in very early stages, he got it and committed to working with us. We clicked right away. I remember we had the song Picture Me, and at first it was more of a strummy, Johnny Cash and June Carter kind of country duet. Mitchell saw it differently and he really knocked it into shape. He took it in a new direction with a brilliant arrangement. It's very Burt Bacharach now. I'm so in awe of Mitchell and his musicality. "But before that, there was the commitment factor. Mitchell got together with Andrew and me every day - well, every weekday - from noon to six, and we just worked. So it was the three of us honing things, coming up with arrangements. It was almost like a Brill Building, let's-sit-down-and-write-a bunch-of-songs feeling. This is very different from life in The Bangles. We're always juggling work and family - getting us together in a room to work on stuff borders between funny and frightening." Two older songs of yours are on the album - Raining, which you wrote with Mike Campbell, and one of your own songs, November Sun. Why did they sit for so long? "David Kahne is brilliant, but he has definite ideas about things. Everybody was trying to do their thing and do it well. I was just a little different then. I wasn't going to fight for things as hard as I would now. And it isn't even a fight now; I just follow my brain and my instincts. There just isn't a lot of chaos in my brain that distracts me the way that it did during the end of the run of Bangles stuff. That was a strange time, honestly." I can imagine. You guys were a really big deal for a number of years - which is all great, but I'm sure the pressures were great, too. "Oh, for sure. You know, I had barely come down from that experience; I was really in the thick of it. And the way that The Bangles parted ways wasn't great. [sighs] It's never easy to make those giant changes in your life. When I made my first solo album, When You're A Boy, I was doing something on my own, which was a very new experience for me. I was responding to a lot of anxiety, pressure and fear. So that's why certain songs slipped through the cracks." "I think a lot of my problems, my frustrations, came from not having the right musical partner. That's why it was so crazily unexpected, in the nicest way possible, to have this kid playing songs in my living room for whoever wanted to hear them. There was something charming about it - charming and inspiring. I found a great songwriting partner. And it was so natural - we were able to just sit down and get songs happening. I'm very thankful for this partnership." How did you and Mitchell decide to reference the '60s on the album? You have done this to some extent in the past, but never so overtly. "I think what happened was, we were in my living room - Andrew and I were on guitars and Mitchell was on piano - and Mitchell was really focusing on my voice. I was sort of talking about Lulu and Dusty Springfield and Petula Clarke, and I think he had heard me sing To Sir, With Love once at a party, so that got Mitchell really envisioning the arrangements in a modern '60s way. The popiness in my voice was nothing for me to feel bad about. "And that's who I am in many ways. I thought about doing some covers, but Mitchell was very firm: 'Do your original songs. That's who you are.' But in doing that, well, I had the tone of the album, the palette, and it was strings and horns and flutes… and Burt Bacharach. I put up a playlist on Spotify, and it referenced the Left Banke, and Glen Campbell with Galveston, and there were The Zombies and Herman's Hermits… and Beatles, of course. The '60s was such a golden period. The songwriting was fresh and pure. Oh, and The Rolling Stones, when they did She's A Rainbow, that was on there. The 1967 thing really blossomed." The Bacharach production and arrangement influence is felt dramatically on Picture Me. Was there a specific song you were drawing from? "There's so many Bacharach songs that I love, so I don't know if it was one. On the playlist, I put on Walk On By; Are You There (With Another Girl), which is more of an obscure one; I put Message To Michael, Do You Know The Way To San Jose?, I'll Never Fall In Love Again - the list goes on and on. The Hal David/Burt Bacharach songs are so spectacular, and nobody writes like that. Somehow, Mitchell could reference the architecture of those songs to frame my voice in just the right way. " The song True cuts to the bone about relationships, the questions that can arise between people who are very much in love. Torn from real life? "Sure. Anybody who's been in a long relationship with someone and has gone through periods where you don't know where things are at, and there's moments where you feel distances, those are hard times to reckon with. So it's very cathartic to write about those feelings, and to show both sides, too. "I feel very blessed to have such an incredible partnership with [husband] Jay [Roach], and we've been together almost 20 years. But in any relationship there are times where you feel alone - and we are alone. So the real truth is, you have to be grateful for those times when you're together and feeling together." At this period of your life, do you feel that you approach songwriting - specifically, your lyrics - differently than you did in the early days of The Bangles? "I think I've already tried to write very honestly about what's going on in my life - even if the names have been changed to protect the innocent! [laughs] You allow for characters that might be composites, or you write about multiple experiences that are combined. But what makes me want to write music is the need to take personal experiences and translate them into melodies and words. "The goal is always to take those experiences and convey them in just the right way. In a song like True, the thing that shines through is the love, even if there's alienation, estrangement, loneliness, hard times - all of that. "I always think of a song like Here Comes The Sun. When George Harrison wrote that, it was all about getting on the other side of something, but it was the other side of something that was miserable and dark. I've always been drawn to the hopefulness that shines through our dark times. That's why I called the album Someday, because it represents that theme of hopefulness and that wish that someday… you'll be in that place you want to be." Your voice never changes. You still sound the same as you did 25 years ago. How can that be? "I don't know why that is. I don't smoke - that might have a lot to do with it. I don't even like to be around smoke. Other than that, I don't know. I've always been an active person, but I have to be really careful because I tend to get hoarse. There's always been a bit of a raspiness to my voice, but it's clear. I'm not sure why I sound the same. [laughs] Hopefully, it'll keep going and going. I certainly wouldn't complain about that."